ChillyBin WordPress Web Design Singapore specialise in website design & development, wordpress, online marketing & consultancy. The world of online communication is evolving, and rather than a customer service agent sitting behind the desk patiently waiting for your enquiry, the world of chatbots in digital marketing has meant that the dawn of artificial intelligence is enhancing customer service and communications. What are chatbots and how are they being used in social media and for customer support? Chatbots are essentially software programs that mimic human conversation and are an emerging trend in digital marketing. Used in social media apps such as Messenger, websites, SMS and email, chatbots work to create a natural and conversational experience for potential customers by carry out some basic customer service tasks. Whether you need your chatbot to gather information from potential customers, make suggestions or help with live updates, there is a chatbot option to suit a wide range of customer service needs. 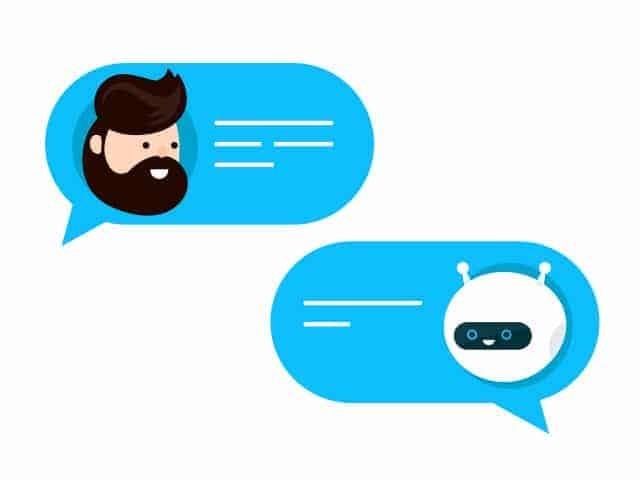 Using a chatbot cuts the cost of human resources and allows for businesses to use the latest technology to receive questions about a company’s products or services 24/7. Being able to operate a business day or night is especially handy if an organisation runs a global organisation across a range of time zones. First off, it’s important to see how innovative businesses are using chatbots to interact with customers and drive customer service. Chatbots that offer suggestions are a fantastic opportunity for eCommerce websites or websites looking to offer suggestions in the decision-making process. Live updates on postage information or delivery details can also be channelled through a chatbot with this specific function. Chatbots that interact like humans are regarded as highly intelligent and work to handle conversations with ease and recognise images, speech, emotions and self-learning. Often used in customer service to determine whether a problem can be solved without direct contact with a human, the auto-responder works to redirect the query and offer a range of answers to commonly asked questions. Often used on Facebook messenger and other high traffic sites, an autoresponder works to reduce the human interaction for customer enquiries while at the same filter out enquiries that need personal assistance. It’s difficult to put all chatbots in a specific box, as there is a wide variety of bots available each with their own unique reason for existing. The main goal for a chatbot is to have a personality and be as similar to a human as possible. If you’d like to check out some effective chatbots that are in use in a range of industries here are some great examples of them in action. If your business is toying with the idea of using chatbots here are a couple of reasons why it’s worth considering. 24/7 customer service – Gone are the days of having businesses that are working 9 to 5, chatbots allow for eCommerce businesses to work around the clock 24/7 – delivering premium levels of customer service all via the web. Saves businesses money – the chatbot revolutionises the business realm by lowering staffing costs and boosting customer service levels – win-win. With a one-time investment in a chatbot, businesses can reduce staff required for customer service and improve the business systems of online businesses. Increased satisfaction from customers – these days customers demand quick service and using a chatbot for some customer service tasks will allow for quick and effective communication with customer enquiries and requests. Even if the question is a repetitive one, the chatbot will always be friendly, polite and attentive no matter the time of day and how many hours they have been ‘hard at work’. These days the world is socially connected, and if you are a savvy business, you’re probably going to have a few social media accounts set up that suit your target market. Review your social media mentions – not all mentions are going to be favourable to do the research and ensure any mentions are responded to particularly in situations where the customer is frustrated or asking a question that needs a timely answer. Programs such as social mention can help you track this so you are always up to speed. Respond quickly – the key to social media it to respond as quickly as possible (ideally in the first hour or less). The purpose of social media is to be instantly connected and waiting to provide a response over a weekend or a few days really won’t fly. Use the right tone in your response – it’s important to use a professional tone in your customer service responses on social media and you always use empathy if the customer is frustrated. Take things offline if they need urgent attention – often there can be situations where conversing over social media to assist with customer service just isn’t going to cut it. If you do think that the enquiry needs a personal response over the phone or even in person, you should take the enquiry offline. Delivering amazing customer service can be as simple as setting up chatbots or a social media customer service strategy. By delivering the highest levels of support, you will be able to build strong relationships with your customer base and create loyal and long lasting customers. To find out more about chatbots and how you can create a social media customer service strategy that makes your stand out from the crowd speak with the team from ChillyBin today. Is your business GDPR ready? We work with clients to create a clear path to drive business growth. To get a better understanding of whether we’re a good fit, we offer a 30-minute obligation-free consultation. Jot down your project details below, and we’ll be in touch. Want to chat? Can, lah. We create websites and applications that will help you generate revenue. Based in Singapore, we offer web design, web development, e-commerce, branding, strategy, WordPress support, content marketing, and SEO services. Copyright © 2019 ChillyBin Pte Ltd. • Company number: 200910914R • Serviced office: 1 Scotts Rd, #24-05 Shaw Centre, Singapore 228208 • Hosted by WPEngine.